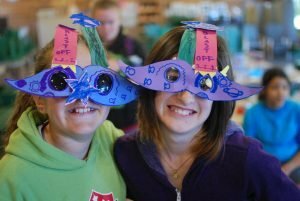 Back to "Summer Camp Descriptions"
In Classic Camp, your experience at camp is all about what YOU want to do. Try out all of the activities that camp has to offer. 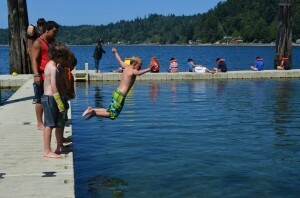 Kids are involved in planning their experience as soon as they arrive at camp. Explore the wonders of nature – play on the beach, build sand castles, skip rocks and go fishing, swimming or rowing. Take a hike to Uncle Wigglebottom’s cabin, go bouldering, play games, make a craft project, and sleep out under the stars. Camp is about making new friends and trying new things! Activities expand for older campers – try archery, canoeing or team-building activities and learn to cook over a fire or camping stove. During full week sessions, everyone goes on an overnight camp-out in the woods. This will be an experience you’ll never forget – crazy, hilarious times, and quiet, thoughtful moments, too. With your cabin group, you take the reins and plan your own week at camp. Try funyaking, paddle boarding, the challenge course, a primitive camp-out, or earn the “Service to Sealth” emblem.